Supermarket giant Tesco has delivered Scottish sheep farmers a slap in the face by selling significant quantities of imported lamb underneath a banner proclaiming to support Scottish sheep farmers. At the Tesco Extra store at Hermiston Gait near Edinburgh, NFU Scotland discovered shelves full of imported New Zealand lamb, all sitting under a banner which claimed it to be ‘The Best Scottish Lamb in Season’. The Union has contacted the UK’s biggest retailer asking it to address the situation; to check point of sale information is accurate at all its Scottish stores and to live up to its pledges by immediately increasing its commitment to buying home-produced lamb. This is peak season for Scottish lamb and the annual ‘Wham Bam Lamb’ campaign promoting Scotch Lamb has been running in recent weeks. That has included TV and radio advertising and the ‘Love Scotch Lamb’ weekend which saw lamb tasting activities at major events, restaurants and retailers – including Tesco. Faced with a very difficult year for lamb prices, angry Scottish sheep farmers are demanding that Tesco urgently addresses this matter. “The deep felt anger being directed towards Tesco over this debacle is wholly justified. This is totally unacceptable. Scotland’s sheep farmers and our consumers deserve much, much better than this. “First and foremost, why is Tesco still promoting imported lamb in shelf-filling quantities when this is peak season for Scottish and UK supplies? This makes its well-publicised pledges of support for Scottish and UK farmers appear wafer thin. “Secondly, this kind of point of sale abuse of the ‘Scottish’ brand makes Scottish farmers’ blood boil. It is difficult to put into words just how angry hard-working sheep farmers feel when they spot some excellent promotion of Scottish lamb in a Tesco store only to find the shelves below are filled with imported product. “Consumers looking to support Scottish farmers and buy Scottish lamb would see this point of sale material, pick up a pack of lamb often without realising that it does nothing to support our sheep sector here in Scotland. “By way of a response, we will not be fobbed off by Tesco telling us that this is a one-off or that it was simply human error because we have had that excuse before. “The UK’s biggest retailer must do better. 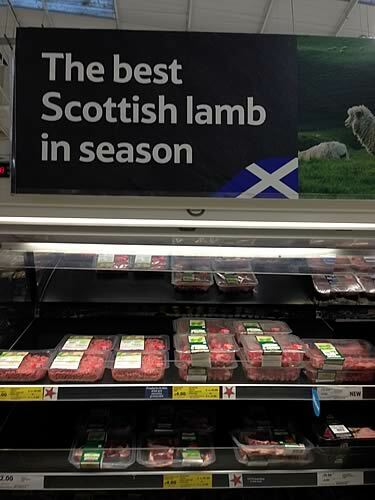 It must urgently review all of its signage in Scottish stores and ensure that where it proudly proclaims to be offering ‘The Best Scottish Lamb in Season’, then that is what is on the shelf. “Tesco’s support for Scottish lamb in what has been a very difficult season is crucial and it is clear that there remains considerable scope for improvement.